Without a doubt that’s the most critical question you face when starting a new blog. How you define your blogging niche is going to determine whether your blog is able to build a viable audience, whether your blog is profitable, and how long it takes for your blog to succeed. 5. So What Is a Blogging Niche Anyway? The most common mistake I see beginning bloggers make is choosing a niche that is too broad. I don't why it is. But as beginning bloggers we all have a terrible fear of going too narrow. But surely, the broader my focus the better? Doesn't that mean I'll get more visitors to my website? The broader your niche, the longer it will take you to get search engine traffic to your website. Because it's much easier to rank for a long tail keyword than it is for a 'head' keyword. It would take you years to rank for the keyword 'seo'. In fact, it might not even be possible. But 'seo for real estate agents'? My guess is you could rank for that quite quickly. It would take forever to get on Page #1 of Google for 'parenting tips'. But what about 'parenting tips for single dads'? You could rank for that keyword in half the time. Also, a narrowly defined topic helps you become an expert quicker. It's easier to become an expert on 'seo tips for real estate agents' than it is to become an expert on 'seo'. With the Hummingbird algorithm, Google puts a lot of emphasis on how well a website covers a topic. It's called topical authority. You'll be able to build much more topical authority for a website on 'seo for real estate agents' than for a website on 'seo'. Because it's a smaller field - there are less topics to cover. Also, there are fewer websites competing in that niche. But it's not only the search engines that prefer narrow topics. A narrowly-defined niche works better with humans as well. A parent who lands on a website that specializes in 'parenting tips' won't necessarily feel a strong bond with that website. But a single father who lands on a website that specializes in parenting tips for single dads will immediately feel a bond with your content. He says to himself: "This is me, this is what I was looking for". Very simply, a blogging niche is a niche that appeals to a subset of a broader market. To get ideas for your blogging niche try using an online niche research tool, such as Wordstream’s free Keyword Niche Finder. There’s an old debate about whether you should blog about your passion or whether you should blog for profit. Some people say that you find your niche at the intersection of passion, knowledge and revenue potential. The naysayers point out that just because you’re passionate about something doesn’t mean there’s a market for it. They argue that if you’re blogging for a living, you need to take a hard headed look at where the profits are. Blogging is hard work and it can take years before a blog takes off and becomes financially successful - passion will keep you motivated when success is still a tiny light at the end of the tunnel. If you’re not passionate about your niche, it will show through in your writing. How will you motivate people to come back to your blog again and again and sign up for your newsletter if you yourself are not deeply motivated about your topic? One way to find out if your niche is profitable is to do some keyword research. You’ll need paid a keyword research tool for this, one that inlcudes CPC (cost per click) as one if its metrics. Type in about 10 keywords associated with your niche. If those keywords have CPC of at least a few dollars, then there’s money to be made in that niche. Go to a newsagent and browse through the magazine stand. See if there’s a magazine dedicated to your niche – publishing is an expensive business and magazines only exist in niches where they can sell advertising. Type your niche keywords into Google and notice if there are any paid ads in the SERPs (Search Engine Results Pages). If there are, it’s a sure sign there are profits to be made in that niche. Go to Amazon and type in a few keywords associated with your proposed niche. Click on the products that come up and see if they have reviews. Every review represents up to 1000 actual customers. If your niche is in the digital sector, go to ClickBank Marketplace and click on the product category that most closely matches your niche. Then sort the products by ‘Gravity’. This is a ClickBank algorithm that indicates how many affiliates are currently making sales of a given product. When you sort by gravity, you’ll be seeing the products that are earning the most affiliate commissions. Use Google to find out if there are affiliate programs within your proposed niche. Just type in ‘[name of your niche] affiliate programs’ and see what comes up. Use Google to see if there are any blogs within your niche. Type in ‘[name of your niche] best blogs’. If there are existing blogs in your proposed niche, have a look at them and notice how the blogs are monetized (are there ads, affiliate banners etc?). You can check long-term trends for any given keyword using the free Google Trends. 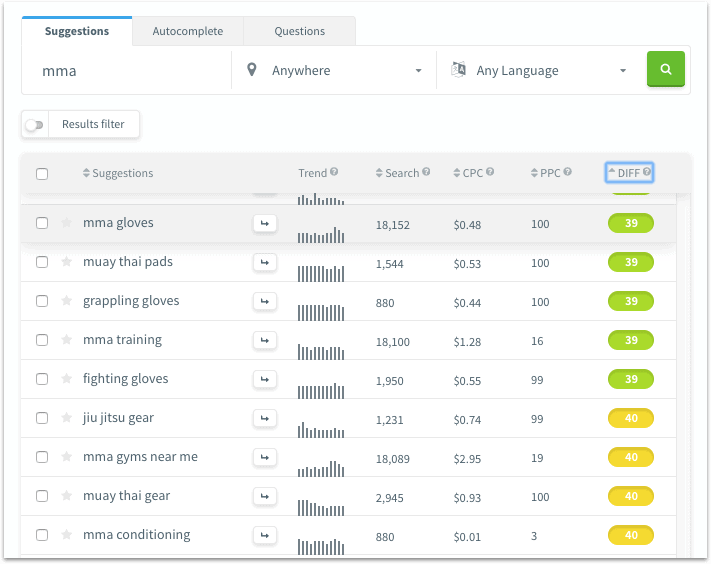 Finding search volume and keyword competition will require a paid keyword research tool, such as Ahrefs, SEMrush, Spyfu, Keyword Tool Pro, or KWFinder. Note: One advantage of Ahrefs over the other listed keyword research tools is that Ahrefs now offers a metric called 'Clicks Per Search'. This is especially important in researching a blogging niche because not all searches result in clicks. Why? Because Google now presents 'Knowledge Cards' right at the top of the search results. When the information you were searching for is presented in a Google Knowledge Card, you don't need to click through because the information is right there in front of you (try typing in 'donald trump age' and you'll see what I mean). So a keyword may have very high search volume but very low CTR (click through rate). That's where the new Ahrefs metric comes in handy! The Google Keyword Planner, which was free, used to be the go-to tool for getting search volume and keyword competition figures. But as of June 2016, it’s only available to people with a paid Ad Words account. So how exactly do you go about researching search volume and competition is a given niche? Rand's method involves running Adwords campaigns that target keywords in your prospective niche and pointing the ads at various landing pages on your site. 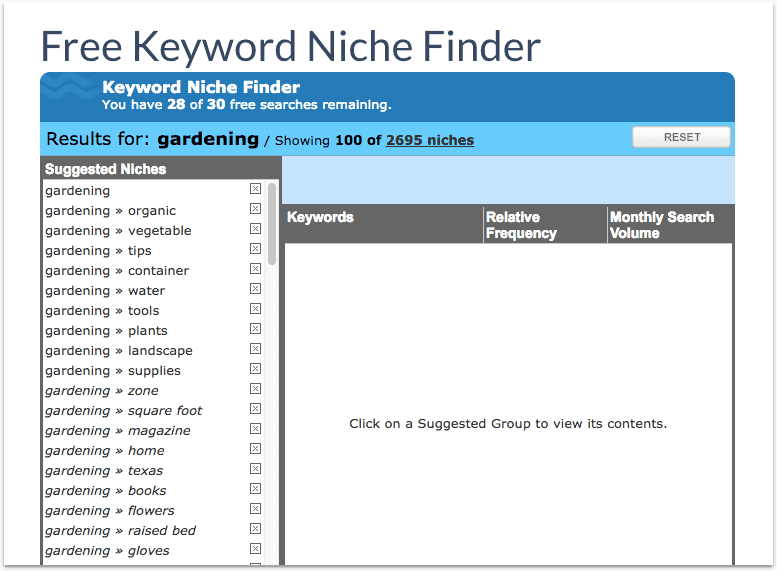 This is the most thorough approach to keyword researching a new niche that I’ve seen. Once completed you’d have a very good idea of the potential of your prospective niche. But it’s quite a complex process that could take a week or two to complete. 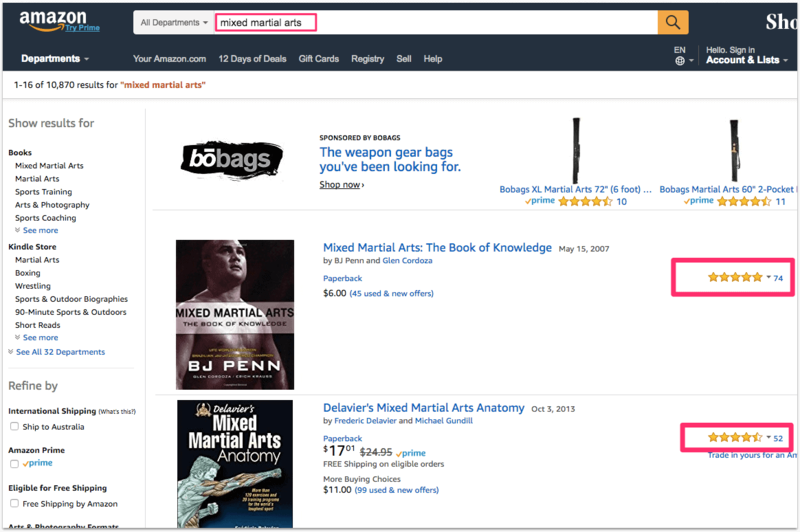 In this example, Brian Clark does keyword research for a potential blog on ‘Mixed Martial Arts’. 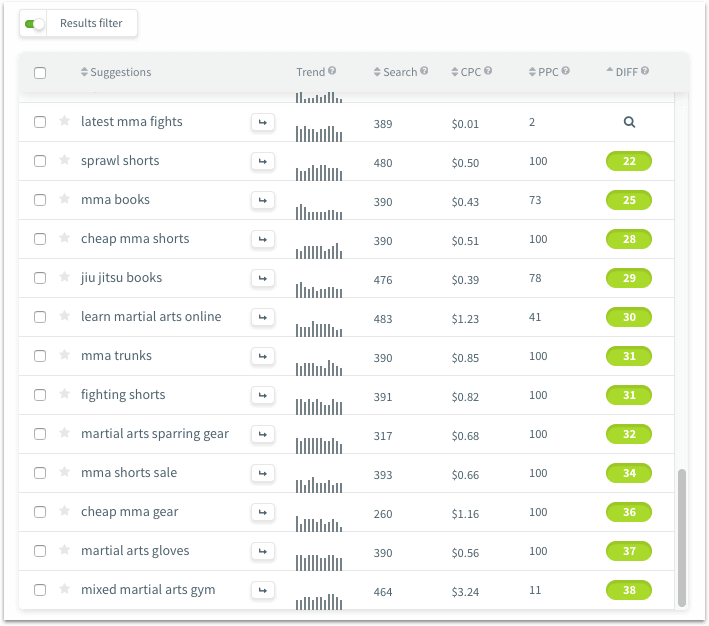 He finds that ‘mixed martial arts’ get 352 searches per day. This is a surprisingly low volume, given the media attention mma has received. But then he digs a bit deeper, looking for semantically related keywords using Wordtrackers Keyword Tool. Now he finds that ‘mma’ and ‘MMA’ have a combined search volume that triples the search volume for ‘mixed martial arts’. Digging still deeper, Brian finds that a related keyword, ‘UFC’ (stands for ‘Ultimate Fighting Championship’) has 9 variations which together add up to 7,098 searches per day! This is a really useful case study that will show you how to go about finding variations of keywords within a niche. More importantly, it shows you how to ‘read between the lines’ and use keyword research to understand searcher intent. This is an important point: researching keywords in a niche is not only about the numbers – it’s also about understanding what people are looking for when they type in their search queries. My own approach to keyword researching a new blogging niche is quite simple - I just take the same keyword research process I use for individual blog posts and expand it. After all, a blogging niche consists of multiple blog posts. However, KWFinder also has a free version that allows you 5 lookups per 24 hours and 50 Keyword suggestions per search. So if you spread the research over a week you could get by with the free version. 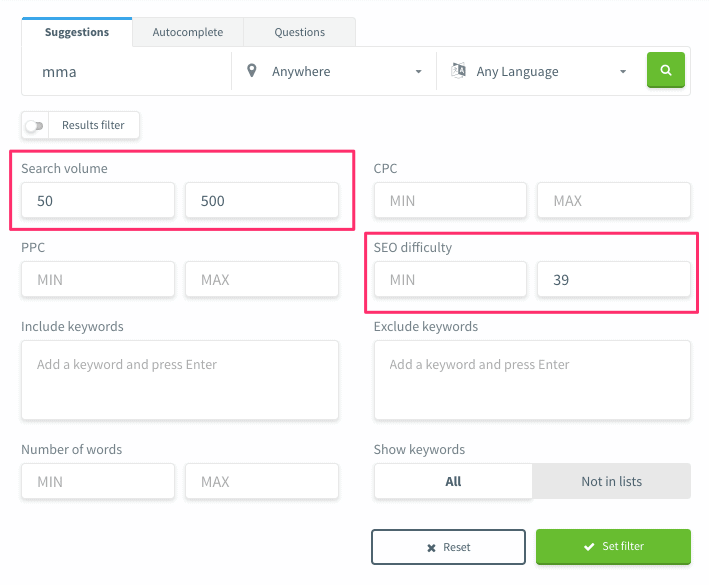 Very simply, I use KWFinder to find long tail keywords with search volume between 50 and 500 and with keyword difficulty of 39 or less. If you can find 20 to 30 long tail keywords that fit those parameters, you have a viable niche. [My assumption here is that if I can find 20 to 30 viable keywords, there'll be at least double or triple that number]. Whatever niche you choose, to succeed in that niche you’re going to have to differentiate your blog from the others. You’re going to need to carve out a territory, find a niche within the niche. This is especially true in competitive niches. No matter how competitive the niche, there will always be an angle that no one else has specialized in. There’ll always be a gap in the topic that no one is covering, an approach that no one has taken. That’s your territory! That’s your niche within a niche. Brian Clark calls this process ‘intensifying’ your niche (‘How To Dominate Your Niche’). He makes the point that you don’t necessarily need to compete directly with existing blogs in that niche. Instead, you can complement them by doing something that they’re not doing. Finding the right niche for your blog will determine whether your blog succeeds or fails - it's that critical. Too broad and you’ll never find your target audience. Too narrow and you’ll struggle to get enough traffic. With topical authority and topic modeling becoming increasingly important in search engine algorithms, finding a well-defined niche is more important than ever. Most beginners make the mistake of going too broad – as a rule of thumb the more narrow your focus, the quicker you’ll find your target audience. When choosing your niche, look carefully at search volume, keyword competition and overall trends. Once you’ve found your niche, study the other blogs in that space and find a way to differentiate your blog. You can think of this as carving out a niche within a niche. And that’s it – you now have the tools to find the perfect niche for your blog! If you found this article useful, please share it on social media. Hi Nehal, thanks for your comment. I’m glad the article was useful, Rob. Helped me a lot ! Thanks so much for your feedback. I’m glad the article was helpful.